ROK trade in program ends July 31st | Challenge of the Americas! Get in on the savings for 2018 COTA season. The Full Throttle Karting trade in program ends July 31. All engines that are eligible for trade in must be operational, including any Rotax engine regardless of year, cylinder, or age level toward the ROK Micro, Mini and GP motors. 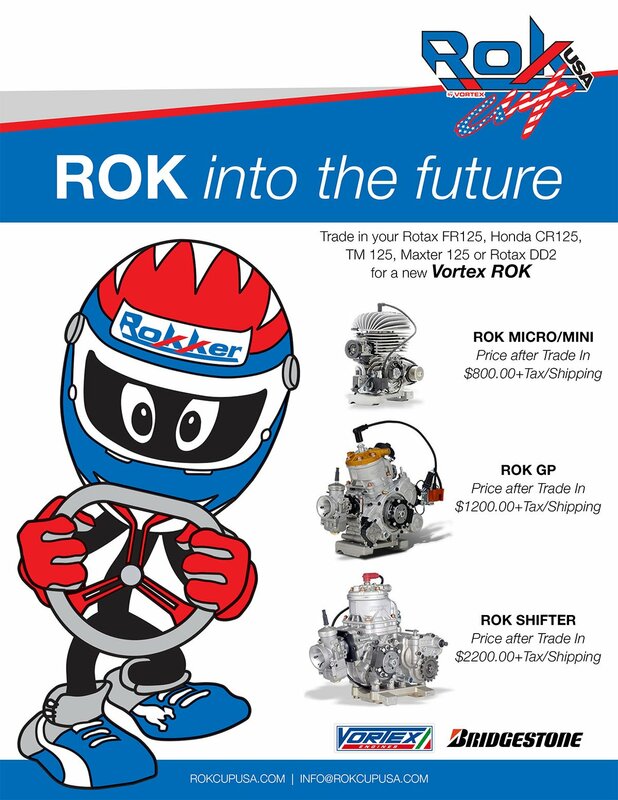 There is also the option to trade in a Rotax DD2, TM 125, Maxter 125 or Honda CR125 for those looking to compete with the incredible Rok Shifter powerplant. All engine packages eligible for the trade in program need to be complete and include the engine itself, wire harness, all electronics, exhaust system and/or silencer, and radiators if they are supplied from the manufacturer when new. Engine components must not have any visible major damage. Prices after the trade in are listed below and must be used towards the purchase of a brand new Vortex ROK engine package.